Inquisitor Gideon Ravenor is one of the finest agents in the Inquisition, the former protege of the infamous (and now missing) Gregor Eisenhorn. Badly wounded in the catastrophe on Thracian Primaris, Ravnor is restricted to a life-support chair but his formidable psi-powers remain undimmed and his allies and agents are among the best in their fields. Ravenor's latest case leads him and his team to Eustis Majoris, capital world of subsector Angelus, on the trail of 'flects', a new drug that induces a form of psychic ecstasy in the subject. Believing the drug trade is being influenced by Chaos, Ravenor joins forces with the planet's law-enforcement agencies to bring the ruinous trade down but discovers many different competing interests are involved in the case. The Ravenor Trilogy is a successor work to the earlier Eisenhorn Trilogy, spinning off several supporting characters into a new story (although there are some story connections to the earlier work). It is also a more developed, much deeper tale than the former. Whilst Eisenhorn was three separate stories linked by some continuing subplots and elements, Ravenor is a much bigger, more epic story split into three acts. As a result Abnett has more time to develop the stories, characters and the background setting (in this case the pollution-wrecked hive world of Eustis Majoris), achieving a deeper and more resonant story than in any of his previous works (although the accumulative narrative drive of the twelve Gaunt's Ghosts novels is impressive). Whilst the action and consequences are large-scale and epic, this is also correspondingly Abnett's most intimate story, with more of the story focusing on Ravnor's team (the psi-warrior Patience Kys, the acrobat-turned-assassin Kara Swole, street-smarts urchin Zael, the cultured data-miner Carl Thonius, and more) and their interrelationships rather than excuses to blow stuff up (although there's enough of that to satisfy most action fans). The supporting cast is also well-defined, with some excellently-portrayed villains and some great secondary roles (Sholto Unwerth and his tendency to quasi-Vancian dialogue in particular). 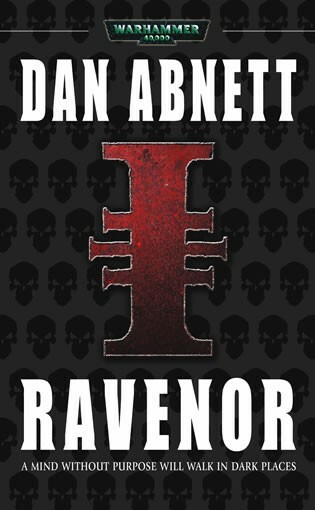 On the negative side, Ravenor doesn't really stand up as a stand-alone novel with a lot of the story left unresolved at the end (although as the first book in a trilogy this isn't entirely surprising), and arguably the promise of the first half where Abnett's prose is markedly superior to what has come before (as solid as that was) is dissipated in the second where explosions and gun battles become more prevalent. Overall, however, Ravenor (****½) sees an already-decent author upping his game to new heights and delivering one of his best novels to date. The book is available now in the UK and USA as part of the Ravenor Omnibus.